“You are the lone-nut” -Elisabeth Ellington. You are 1) alone, and 2) crazy. Welcome to the wonderful world of teaching. Upon first hearing this statement, I, like many of classmates, went into an instant panic. How is it that you can manage a classroom without knowing what to expect, how to act, or how to handle your students? The answer…you don’t. I have come to the painstaking conclusion that I will have to put my OCD and perception of perfection in “time out” when it comes to “me in the classroom.” It is impossible to know how to act, when you have never been in the place to act. You cannot expect what you haven’t experienced. You cannot succeed without failing. Now that’s enough to make any pre-educator run for the hills or to the blank employee application to McDonalds. UNLESS (ah, yes!) 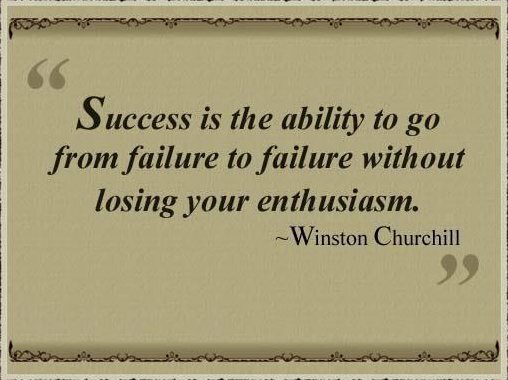 unless you are able to realize that failing is actually the golden key. Failing enables you as a teacher to demonstrate your vulnerabilities as a human being, to show your students that mistakes are mistakes NOT tragedies, to show your students that YOU ARE HUMAN. Teachers make mistakes, students make mistakes, the President of the United States of American makes mistakes. And you know what, that. is. okay. There I said it; mistakes are okay, failure is okay. I’m okay with failing! But, I am only okay with failing when I can grow from it. I can only allow myself to fail if I can allow myself to find the success in the failure, to move forward and struggle on, to change the bad and try the good (even if it turns out to be another “bad”). I sound like a lone-nut. I am a loner to my future classroom….and that drives me crazy. So what can I do about it? Plan? Plan so much that I cannot fail? No. For myself, for my sanity, I must not plan details but rather plan strategies. I must plan me, my interests, my habits, my practices. These aspects will shape my success, they will shape my failure, and they will shape how I work through the failure. I loved your post! I think we’ve got to get Maggie to blog about how science works, because I keep thinking of ways it’s like teaching. First, you have all these variables, many of which are actually outside of your control entirely. I certainly can’t control what students bring with them to my classroom, physically, emotionally, mentally. The student who didn’t sleep last night, who didn’t eat breakfast, may not be ready or able to learn today. The student who got humiliated in the class before mine is also going to bring an emotional situation to my classroom that might make it hard for her to learn or perhaps make her feel like creating problems in my class. There’s me–and some days I’m tired or irritable or distracted. There’s the material we’re studying. There’s the work the students are creating. Maybe rather than continuing to harping on failure and how wonderful it is, I’ll try to repackage that (is it too late??) as trial and error. Doesn’t that sound nicer than failure?? I love what you say about planning strategies. I change the details of what I do frequently, but my overall strategies (my big picture vision of what my classroom is all about) stays fairly consistent.